Php 7.2 - is it fully supported? Hi, I'm on PHP 7.0 without bugs, and I don't think that a version of PHP be a problem with s2Member... If anyone can confirm that? I'm also curious if s2member will work on PHP 7.2? My server is going to be updated to 7.2 this week. *     hang indefinitely. This is bad. *     we get insufficient entropy errors. // Windows on PHP < 5.3.7 is broken, but non-Windows is not known to be. Feel free to test in a dev installation before upgrading the live site to PHP 7.2 if you feel insecure, though. And it's always good practice to create a full backup before such a change. Just wondering, is it possible to revert a server back to the previous version of PHP if the new version is causing issues? Or are you stuck with the new version once you upgrade? You could contact your webhost to ask them how you do that, so you're ready for it in case you need it after the upgrade. Has anyone confirmed that s2Member (and Pro) is working in PHP 7.2? 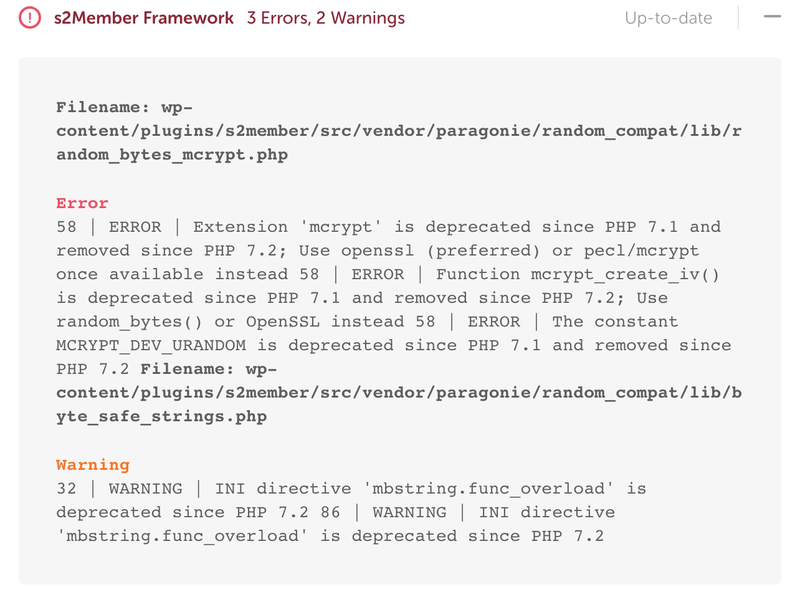 I just ran the PHP Compatibility Checker plugin and got the same 2 warnings and 3 errors as mentioned above. I know Cristian answered that the files in question should not be a problem, but has this been confirmed? s2Member is actually the only WP plugin I'm using that gives me any warnings or errors when tested against 7.2. I am currently running PHP 7.2.15 on Ubuntu 18.04.2, I have s2Member Pro and do not have any issues with it. I am on a dedicated server and do not have any other PHP versions installed or enabled. I also have Query Monitor installed and there are also no reports of errors from s2Member.